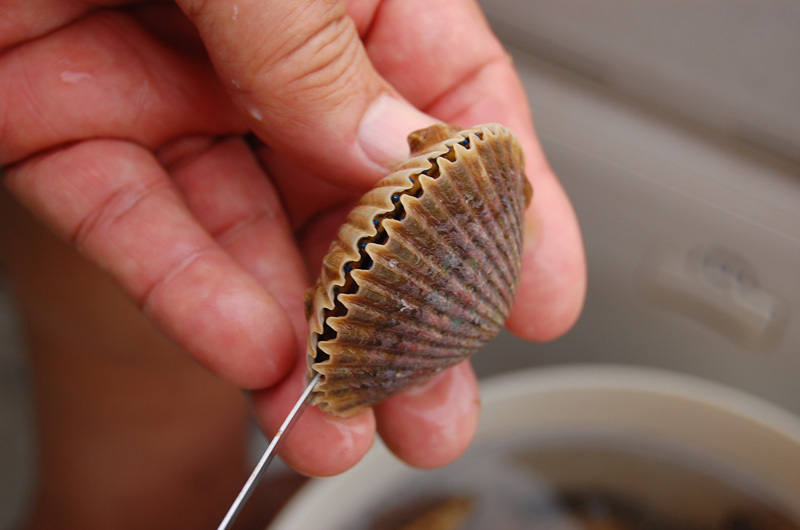 What does it take to hunt the wily [Argopecten irradians concentricus], a.k.a the Atlantic Bay Scallop you ask? Surprisingly not much. Snorkel gear, a boat, at least one working arm/hand and something to put your captured scallops in while you swim around looking down on endless acres of eel-grass. 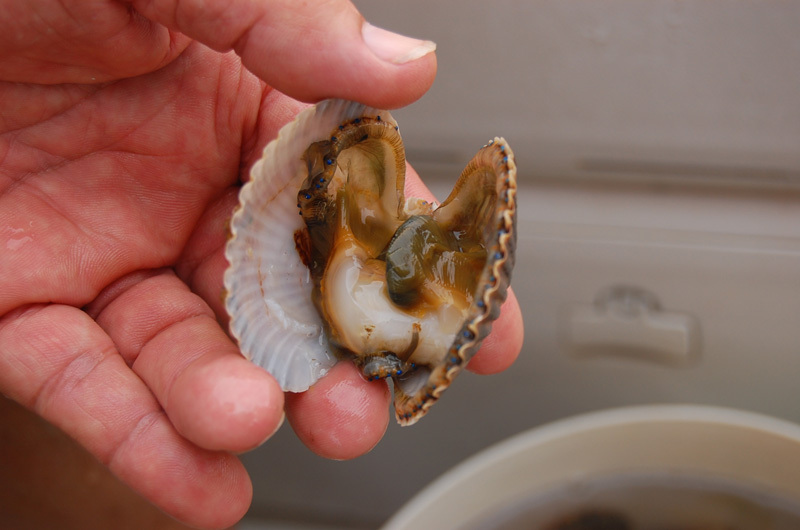 Gulf bay scallops can be found in water up to ~10ft deep but with snorkel gear, the best depth is 3-4ft. All it takes is a bend in your waist to drop you low enough to grab the scallop and you aren’t constantly brushing the grass with your body. Anything deeper and it becomes more of a diving expedition rather than snorkeling. Grab one of your soon-to-be tasty mullusks from the bucket and slip your shucking knife into the right side of the shell at the base. The object here is getting the blade up along the top of the shell so you can cut the muscle attachment. 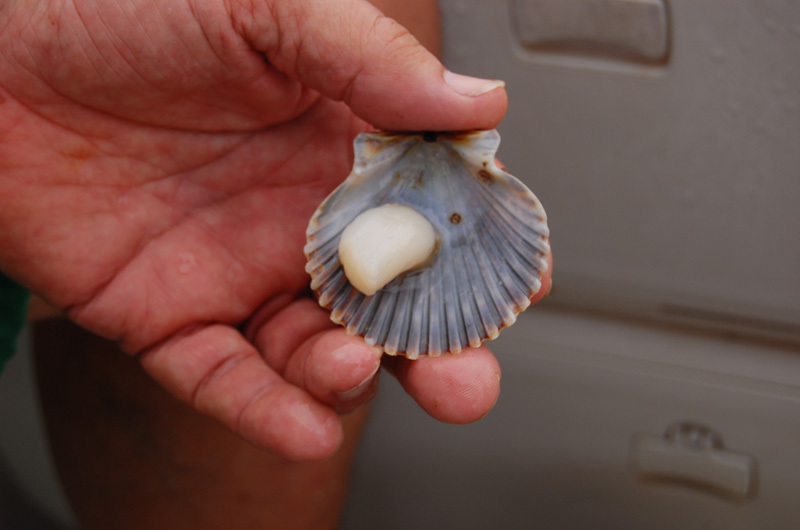 If you do it right, the shell just flips open and you’re left with both halves open in your palm. Most scallops open as soon as you pull them out of the water but sometimes you get a smart one that tries to stay “clamed up”. In this case, setting it on the boat deck in the sun for a minute or two usually convices it to open up at least wide enough to slip your knife in. I think some people go the opposite route and put their un-shucked scallops on ice prior to processing – apparently it forces them all to open but we’ve never had a problem with just letting them sit the deck for a minute or two. Take your knife and run it along the outer edge, scraping the “lip” off each half of the shell. If you do it correctly, you should basically just have a pile of guts free from the shell but still attached to the scallop medallion. Slide the knife along the bottom of the shell with the blade edge resting up against the medallion muscle. Gently scrap/pull the guts up and over the medallion in one clean motion using your knife thumb to help with the pull-over. This is the tricky part and takes a bit of practice to perfect. After a while, you can get the shucking motion down to 3-4 quick movements with the knife. At this point you have two choices depending on how you plan on cooking your scallops – you can leave the medallion attached to the shell or you can cut it free. Either option works as long as you rinse the medallion with fresh water and ice them down prior to transport. We ocassionally keep part of our catch on the half-shell so we can grill them as appetizers during dinner back at the hotel. Once you have them shucked and cleaned, you can store them in quart freezer bags and keep them frozen for almost as long as you want. Everybody has their [favorite scallop recipe]. The options are endless – this year my cousin Karen tried experimenting with a scallop omlet that apparently turned out pretty well.